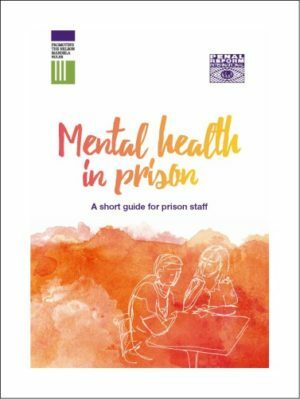 Today, Penal Reform International has published a new short guide for prison staff on addressing the mental health needs of prisoners. People in prison – totalling 10.2 million people on any given day – are disproportionately affected by mental ill-health, with around one in seven having a serious mental health condition. While there is growing awareness of this challenge, which affects prison systems in every region, many lack resources to employ sufficient numbers of mental health professionals. Prison staff are therefore frequently at the forefront of meeting the mental health needs of the people in their facility. They face the consequences of supervising people with mental ill-health on a daily basis, yet frequently do not receive the necessary training or support. Prison staff play a vital role in the prevention of mental ill-health and can improve prisoner well-being as part of their daily work. Positive attitudes can also help to overcome the stigma that many people with mental health problems face. The publication seeks to help prison staff understand and respond appropriately to the mental health needs of adult prisoners. It focuses on how prison staff can promote and protect mental health and well-being and enable those with existing conditions to function better in the prison environment. Guidance is based on a human rights-based and holistic approach, as required by the UN Standard Minimum Rules for the Treatment of Prisoners (the Nelson Mandela Rules). PRI would like to thank the financial assistance of Matrix Chambers, as well as contributions from a range of international and national mental health experts and practitioners.